Sometimes the smallest interventions have the biggest impact. 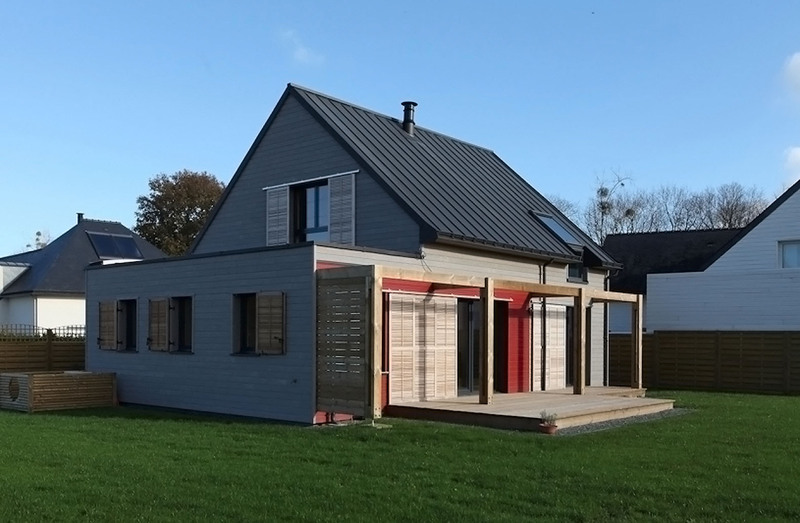 French architect Patrice Bideau gave this pitched roof house in France a green makeover, transforming it into an energy-efficient home that complies with French standard RT 2012. The architect used bio-sourced materials, tissue fiber wood, brick, concrete and raw earth to insulate the house, using bioclimatic principles to achieve a high level of year-round comfort. 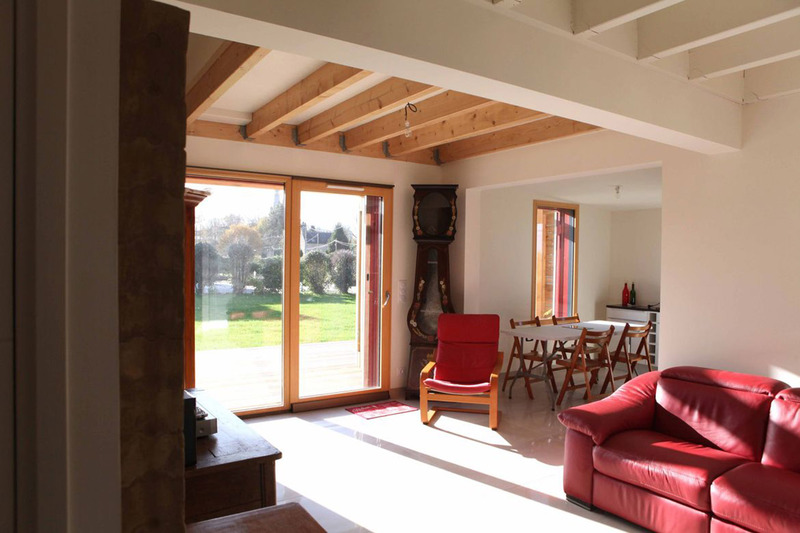 The house is located in an environmentally protected area near the Sainte-Anne-d’Auray Basilica, the third most important pilgrimage destination in France. It comprises three parts: a garage and storage area; a living area with a lofted bedroom, bathroom and a mezzanine study in the converted loft space under the pitched roof; and a kitchen and laundry situated in the third section. Each part is separated by concrete elements and plaster-tiled partition walls and then insulated to prevent heat transfer and increase the interior thermal mass. The wall between the garage and the main house has Rockwool insulation covered with wood cladding, while the internal partitions are plastered and protected to prevent heat transfers between the floor and heated living areas. The pergola and sliding shutters on the south-facing facade provide shade in hot weather. Thermal comfort is further increased by including a heat pump, a thermodynamic water heater and a one-way airflow central ventilation system. The house is located in an environmentally protected area near the Sainte-Anne-d’Auray Basilica, the third most important pilgrimage destination in France. It comprises three parts: a garage and storage area; a living area with a lofted bedroom, bathroom and a mezzanine study in the converted loft space under the pitched roof; and a kitchen and laundry situated in the third section. Each part is separated by concrete elements and plaster-tiled partition walls and then insulated to prevent heat transfer and increase the interior thermal mass. The wall between the garage and the main house has Rockwool insulation covered with wood cladding, while the internal partitions are plastered and protected to prevent heat transfers between the floor and the heated living areas. The pergola and sliding shutters on the south-facing facade provide shade in hot weather. Thermal comfort is further increased by including a heat pump, a thermodynamic water heater and a one-way airflow central ventilation system.